For decades, speculation about extraterrestrial life has been boosted by tales of flying saucers and encounters with aliens. It is now being fuelled from a more serious source. In August 1996 NASA researchers claimed to have found evidence for simple life forms in a meteorite allegedly from Mars. Since then, this ‘proof’ of life in the ‘Mars rock’ has very much lost favour among the scientific community.1 In spite of this, the two kilogram rock found in Antarctica has ignited a new surge of ‘Mars fever’. In the next 20 years, the Americans, Europeans, Japanese and Russians plan around 20 projects to explore our neighbouring planet, some 78 million kilometres away at its closest approach to us. Meanwhile, belief in extraterrestrial intelligences continues to grow with an almost religious fervour. A series of ‘flying saucers’ caused a stir in southern England before being revealed as hoaxes, complete with sound effects from built-in batteries and loudspeakers. evolved once, let alone twice or more. (a) Never a single contact with an ‘extraterrestrial’. In 1900, the French Academy of Science offered a prize of 100,000 francs for the first person to make contact with an alien civilisation—so long as the alien was not from Mars, because the Academy was convinced that Martian civilisation was an established fact! Since then, not a trace of ‘little green men’, or indeed any life, has been found on any of the planets which our probes have been able to explore. Despite this, a great number of astronomers think that, since life evolved here on earth, it must have evolved near one of the many stars out there. In America SETI (Search for Extra Terrestrial Intelligence) researchers have scanned the sky, looking in vain for signals from intelligent beings. (b) Conditions must be ‘just right’. Life on any planet can only survive in the presence of a great number of very stringent requirements. For example, it must be at the right distance from its sun, so as to be neither too hot nor too cold. Although one cannot rule out the possibility that planets around other stars may be confirmed at some future point, it is at least extremely improbable that any of them would fulfil all the requirements needed for life. Just having liquid water is completely insufficient, despite the excitement reigning when such was detected as possibly being on the surface of Jupiter’s moon, Europa. (c) Life cannot form spontaneously anyway. Without intelligent, creative input, lifeless chemicals cannot form themselves into living things.2 Without this unfounded evolutionary speculation, UFOlogy would not have its present grip on the public imagination. Even if one assumed the existence of life somewhere else in the universe, a visit by extraterrestrials to earth, such as is claimed in UFO reports, seems completely impracticable, if not impossible. The distances (and therefore the likely travel times) are unimaginably vast. The closest star (apart from the sun) to earth, Proxima Centauri, is already 40.7 million million kilometres (c. 25 million million miles) away. The Apollo flights took three days to get to the moon. At the same speed one would need 870,000 years to get to this nearest star. Of course, one could accelerate (particularly unmanned) probes to a greater speed. At the incredible speed of one-tenth of the speed of light, the trip would still take 43 years. However, one would need enormous amounts of energy to reach such a speed—energy roughly equivalent to the electricity output of the world’s largest hydroelectric power station for four days (for proof, see Addendum 1). Many UFO enthusiasts spread the urban myth of secret U.S. Government experiments on aliens, etc.—an idea reinforced by the movie Independence Day. However, under the inspiration of atheists like the late Carl Sagan, the U.S. government has spent millions of dollars listening ‘out there’ for signs of intelligent ET life. Many other evolutionary humanists, like Sagan, passionately believe that intelligent life has evolved ‘out there’ in addition to earth, and would pounce on any hard evidence for this idea. Consider the recent media frenzy about the ‘life in Mars rock’ fiasco. To imagine that a much more exciting discovery would be kept secret for decades seems beyond credibility. (a) Scripture does not mention ‘ET’ visits. (b) The purpose of the stars. We see from this that stars are there for mankind on earth. Add to this the sequence of creation (on the first day the earth, and only on the fourth day all of the stars), and it is easy to see the thrust of the biblical testimony, that the purpose of creation is uniquely centred on this earth. 3. So what about UFOs? How, then, should one understand the UFO phenomena and all the associated ‘hype’? 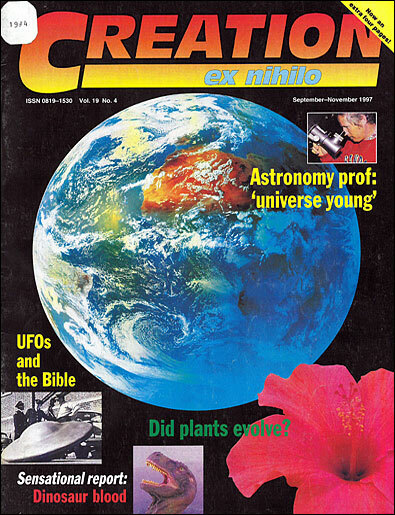 In the German magazine Focus, it was recently stated ‘90% of UFO reports turn out to be humbug, but there is a residual 10% which are not easy to dismiss.’5 ‘Humbug’ refers to natural phenomena such as heavenly bodies, noctilucent clouds, ball lightning, and man-made objects such as glowing blimps. The Bible gives a description of reality concerning all living things. The living God reveals himself as the Triune One, Father, Son and Holy Spirit. In heaven there are the angels, who also serve mankind on the earth. There is another reality—that of the devil and the demons. Ephesians 2:2 talks about the ‘prince of the power of the air’, whose reign is on earth. The devil has his own repertoire of deception in the form of various occult practices and a multitude of religious rites. Could it be that, behind those unexplainable reports, is the work of the arch-deceiver?7 UFO reports, by definition, remain nebulous and not identifiable. People who do not know Christ are easily fascinated by all sorts of phenomena which are difficult to explain. For Christians there is Jesus’ warning in Matthew 24:4 to ‘Take heed that no man deceive you.’ The best antidote to deception? Paul exhorts us, in 2 Timothy 2:15, to study the Scripture, so we might be ‘rightly dividing the word of truth’. The following calculations didn’t appear in Creation magazine, but are given for the benefit of the technically-minded to confirm Dr Gitt’s points. The largest hydro-electric power station in the world at present, Itaipu, is jointly run by Brazil and Paraguay and has an output of 12.6 million kilowatts. Total energy generated by the 18 turbines in four days is exactly equal to the kinetic energy of the above-mentioned 10 kg spacecraft moving with a speed of c/10. For a manned spacecraft weighing several tonnes, the energy requirements would exceed the world’s annual electricity consumption. For the city-sized spacecrafts in Independence Day, the energy requirements would be even more staggering. And when the spacecraft slowed again, it would need to use up almost this amount of energy in braking. If the spacecraft had to accelerate to c/10, slow down and start up many times, it is hard to imagine how enough fuel could be carried. And this is the absolute maximum amount of energy which could be produced even in principle from a given mass of fuel. A real spacecraft would be nowhere near as efficient. = 4.5 x 1010 J. = 9.95 tons of TNT. Therefore the impact energy of one of those 0.1 g objects would be the equivalent of an explosion of about 10 tons of TNT. Return to note 3. J.D. Sarfati, Life on Mars?, Creation 19(1):18–20, December 1996–February 1997; Life from Mars?, Journal of Creation 10(3)293–296, 1996; Bob Holmes, ‘Death knell for Martian life’, New Scientist 152(2061/2):4, 21–28 December, 1996. Return to text. Some recent creationist critiques of evolutionary origin of life theories are S.E. Aw, The Origin of Life: A Critique of Current Scientific Models, CEN Technical Journal 10(3):300–314, 1996; J.D. Sarfati, Self-Replicating Enzymes, CEN Technical Journal 11(1):4–6, 1997. A very thorough treatment is the book by C.B. Thaxton, W.L. Bradley and R.L. Olsen, The Mystery of Life’s Origin, Philosophical Library Inc., New York, 1984. See also Q&A: Origin of Life. Return to text. This means there is a very small chance of hitting one in each linear kilometre travelled, but over such vast distances, the probability approaches certainty. See Addendum 2 for a calculation of the damaging effects of dust at such high speeds. Return to text. Furthermore, Jesus dying for alien beings makes no sense, since Jesus became a man, and remains the God-man forever to be our Saviour. The whole purpose of creation is focused on the race on earth, of which some will be Christ’s bride throughout eternity. Christ will not have multiple brides. Return to text. Hallo Erdling, Ufologie, Focus 45:254, 6 November 1995. Return to text. Ref. 5, p. 252. Return to text. William Alnor, cult expert and award-winning journalist, has studied the UFO phenomenon for many years. His book UFOs in the New Age (Baker Book House) documents his investigations leading to the conclusion that the UFO phenomenon has an occult source. Return to text.